The third and largest of the Perini Navi Group's Picchiotti Vitruvius series yachts, the 73m motor yacht Grace E, has been launched. Picchiotti's new flagship shares the same hull and superstructure design of her predecessors, 50m Exuma and 55m Galileo G. Born from the collaboration between Vitruvius Ltd, Philippe Briand and the Perini Navi Group, the series is built in aluminium and characterised by streamlined, slender lines and follows the principles of the BOS Hull (Briand Optimized Stretched Hull). Grace E features advanced diesel-electric propulsion with two Azipod propellers, and she cruises at 16.5 knots. Exterior living spaces are spread out over five decks, and the upper deck is dedicated to wellness, hosting a gym, sauna and hydrotherapy equipment. 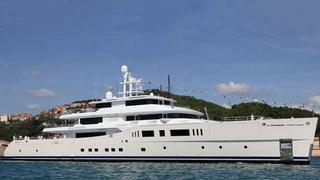 Grace E's elegant and contemporary interior is by Remi Tessier, and she accommodates 12 guests and a crew of 22. Underway at the Perini Istanbul-Yildiz shipyard is the first sailing yacht in its new 70m series, scheduled to deliver in 2015, and also the third yacht in its 60m series, which can deliver in two years. At the Italian shipyards, Perini Navi currently has the second 60m yacht, sloop C.2218, in build, which is scheduled for a 2014 delivery, as well as the second yacht in the 38m Racing Line.